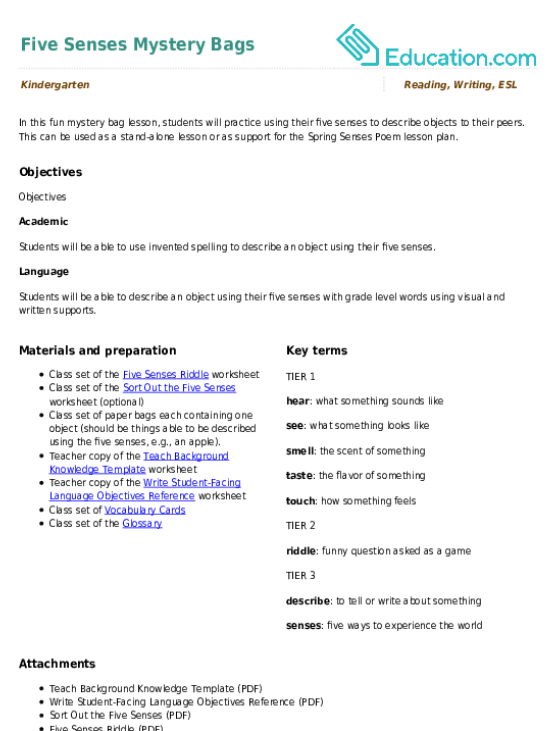 This lesson can be used as a pre-lesson for the Spring Senses Poem lesson plan. Class set of paper bags each containing one object (should be things able to be described using the five senses, e.g., an apple). 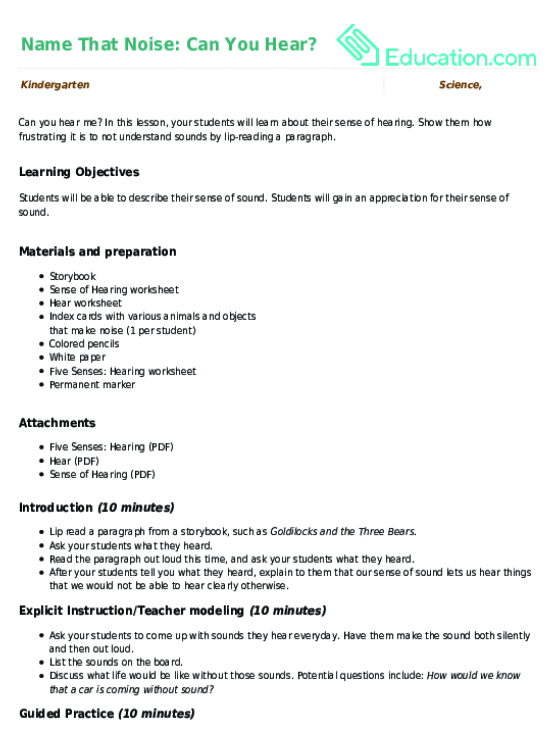 Students will be able to use invented spelling to describe an object using their five senses. 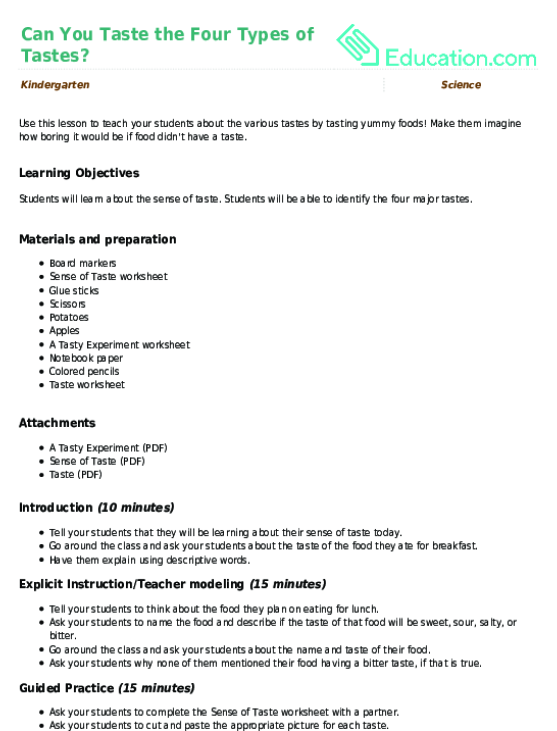 Students will be able to describe an object using their five senses with grade level words using visual and written supports. Prewrite a simple five sense riddle on chart paper. For example, "I see swirling colors, I hear licking tongues, I taste chocolate, I feel icy cold, I smell sugary sweet cones" and post (covered so that the students cannot see before the lesson begins). Introduce the lesson by showing a picture of a cookie and asking students to identify what they see. Then ask the students to turn and talk to a partner to share what they can see in the picture (colors, textures, etc.). Say, "You are using one of your five senses to describe the cookie: your sense of sight. Our senses are the way we understand and describe the world around us. Your other senses are your sense of smell, touch, hearing, and taste." 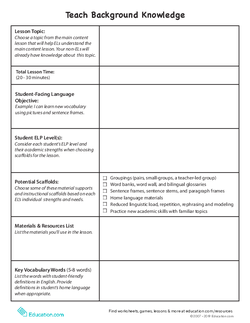 Introduce the new vocabulary words using student-friendly definitions (you can use the Vocabulary Cards and Glossary as references). 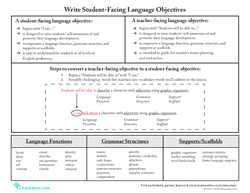 As you introduce the terms, have students turn and talk to a partner to use one of the new words in a sentence. Explain that today students will get to practice using the new vocabulary words and their senses when solving and creating their very own riddles! 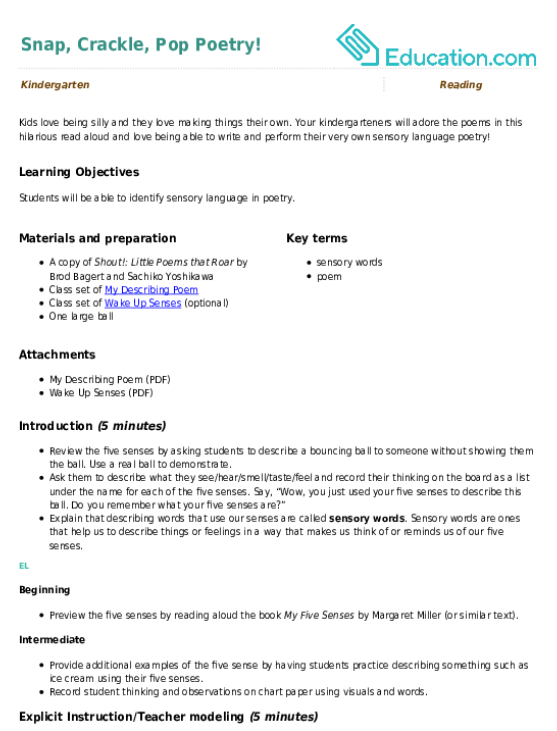 Display the prewritten riddle to the class and read it aloud, touching each word as you read it. Ask students to listen as you read the riddle again, this time trying to think of what you are describing. Have students turn and talk to a partner to share what they think the answer to the riddle is. Invite students to share out their ideas until the correct answer is given (ice cream cone). Go over each of the senses and the describing words you used in your riddle. Explain that now students will get a chance to create their own riddle for a classmate. Split the class in half and demonstrate selecting a mystery bag and identifying the contents. 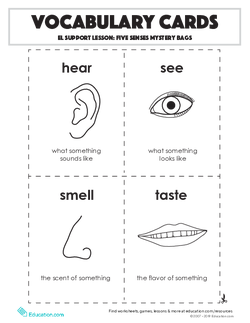 Then describe the object using the five senses, "I see____, I hear____, I smell____, I taste____, I feel____." While students guess what it is (even though they can see it, this is for demonstration purposes only). 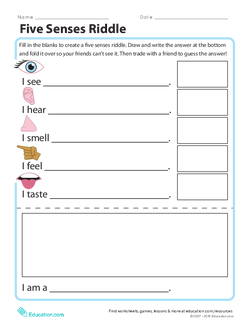 Hand out the Five Senses Riddle worksheet and one bag to each student. Explain that they will first write or draw each part of their riddle before sharing it with a classmate to guess what it is. 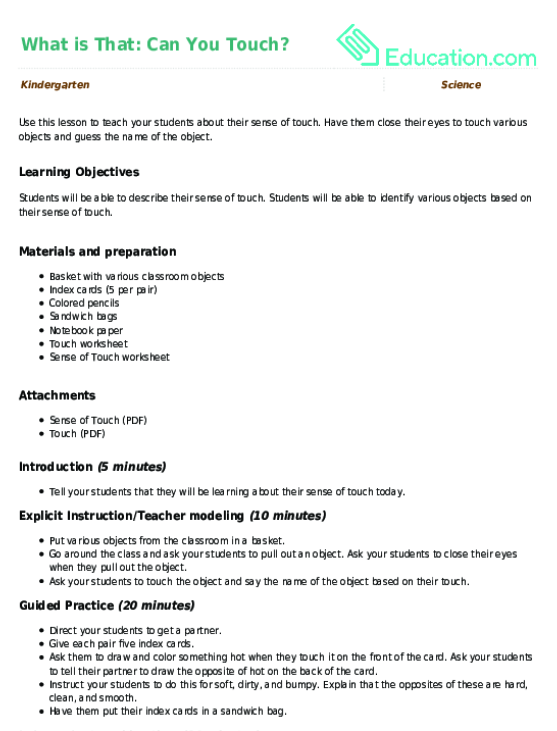 Have students practice matching the five senses using the Sort Out the Five Senses worksheet for additional practice matching and identifying the five senses. 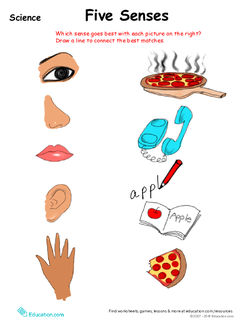 Invite students to write a second riddle using their five senses. Encourage students to create more detailed clues. As students are creating their riddles, assess if they are able to differentiate between the senses and accurately describe their object. 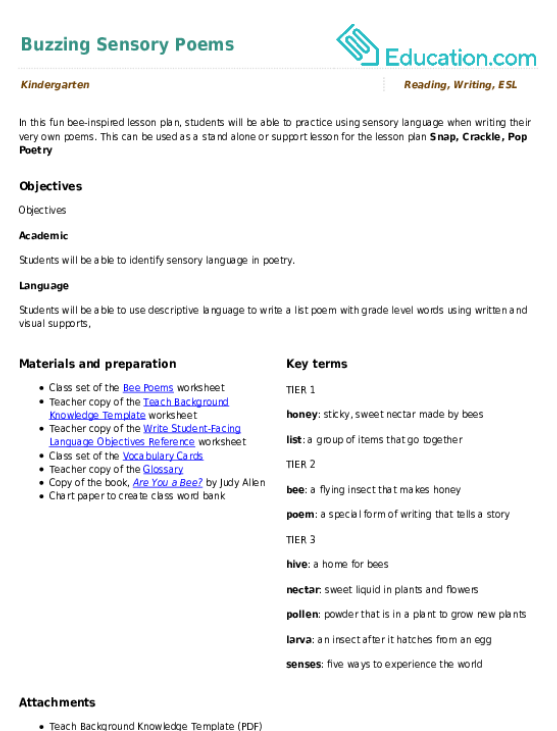 Collect student riddles and assess if students are able to use invented spelling to describe their objects. Invite one to two students to share their riddles to the whole class. 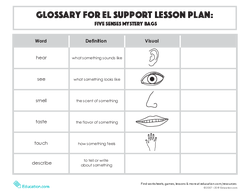 Close by saying, "We can use our five senses in so many ways! Making a riddle is one fun way that we can practice describing what we see using our five senses." What is That: Can You Touch? Can You Taste the Four Types of Tastes?